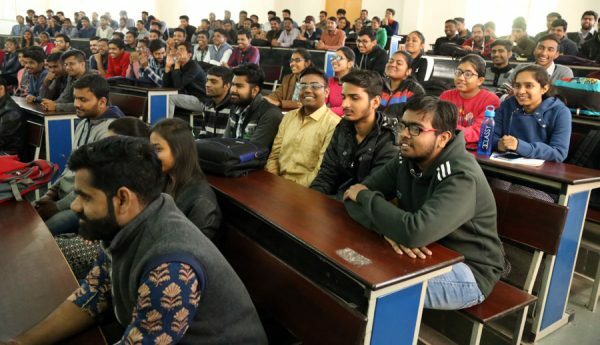 Udaipur : The Basic Science Department, in collaboration with Creative and Fine Arts Club at College of Technology and Engineering (CTAE), MPUAT, Udaipur organized an expert lecture by Prof. P.K. Dashora, Ex-Vice-Chancellor, Kota University on 2nd February, 2019. It was presided over by Prof. Ajay Kumar Sharma, Dean, CTAE. The theme was Creativity in Education, and Prof. Dashora, with his years of experience, inspired the students to excel in life by broadening their horizons and thinking out-of-the-box solutions to problems. It was an interactive session towards the end of which, he also gave the students tips and tricks that would help them in their career. It was followed by a PowerPoint Presentation Competition for First Year Students. 22 students were shortlisted for this round and presented their perspectives on Creativity in Education. Every participant was given 5 minutes for the presentation, in which they showcased a plethora of new ideas, using audio-visual aids. Three winners were chosen on the basis of their content and delivery of the presentation.Ms.Yashi Agarwal won first prize, Second prize was won by Ms.Ami Sharma & third prize by Ms.Priyanka Pandey. The events were successfully organized by Prof. A.K. Chittora and Ms. Nitika Gulati, coordinator and sub-coordinator of the club respectively, and sponsored by IDP/NAHEP.